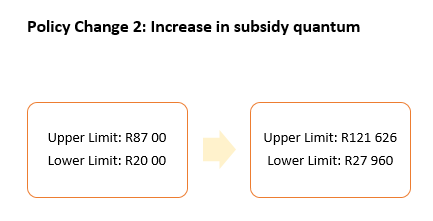 In July 2018, government approved changes to the Finance Linked Individual Subsidy Programme (FLISP) which targets households in the ‘gap’ market—those who are too rich to qualify for the RDP subsidy but too poor to easily afford a new house. FLISP is intended to assist these households in accessing housing, through a contribution by government that increases the size of a home loan which they can afford or reduces their monthly repayments. This blog highlights the key changes to the programme which were introduced in July 2018 and implemented with immediate effect—and begins to discuss how these changes may impact upon access to affordable housing by low income households. 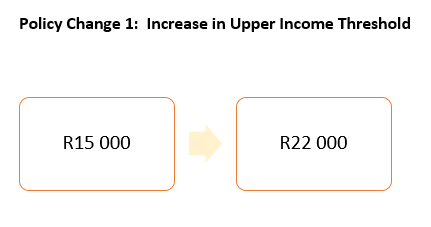 Firstly, the eligibility criteria have been changed to allow for households with higher incomes to apply for a FLISP: the FLISP upper income threshold was increased by R7 000, to R22 000 per month. This shift will widen the scope of the number of people that the programme can reach–it anticipated that another potential 1.36 million households may qualify for FLISP. Although this shift expands the reach of the programme up the income pyramid, the Department of Human Settlement’s 2017/2018 Annual Report notes that the general under-performance in the delivery of government-subsidised housing units has resulted in a lack of affordable stock for people earning less than R15 000 per month, a factor that hinders the performance of the FLISP programme. What does this mean for the average household? Previously, if you earned R3 501/month, you would get a subsidy of R87 000 and your monthly payment on a house of R200 000 (at an interest rate of 10 percent) would be R1 090. But now with the new FLISP amounts, your monthly repayment for the same house would only be R756 per month, resulting in a savings of R334 each month. 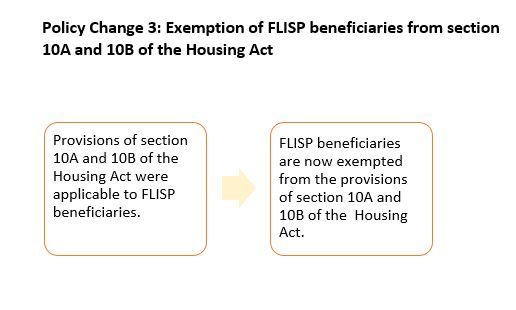 Previously, recipients of FLISP–similar to all RDP housing beneficiaries–were subject to the provisions of the sections 10A and 10B of the Housing Act (Act No. 107 of 1997) which state that beneficiaries may not sell their homes within eight years of taking ownership. The intention of this sales restriction is to ensure that households receiving the government subsidy reside in, and benefit from ownership of, the house they have received with government support. However it has been argued that the sales restriction reduces the ability of households to benefit from the house as an economic asset, should they wish to move up the housing ladder, or must relocate in order to access job opportunities or due to changes in household or family circumstances. Because of the sales restriction, government housing beneficiaries are unable to sell their homes on the resale market until eight years have passed, thus reducing the supply of houses at the lower end of the market which could be purchased with a FLISP subsidy. For this reason, government recognised that the sales restriction was hampering the successful implementation of FLISP and therefore took a decision that the sales restriction (as set out in sections 10A and 10B of the Housing Act) would no longer apply to properties acquired through a FLISP. However, although this policy decision was taken, the Housing Act itself must be amended before this change can take effect. In the meantime, government plans to retrospectively apply alternative relief as allowed under section 10B(5) of the Housing Act, which authorises the MEC to grant an exemption from these restrictions in certain cases. According to the recent 2019/20 Budget Vote for Human Settlements (pg. 846), government provided 2 253 FLISPs in 2015/16, 2 660 in 2016/17 and 2 295 in 2017/18, showing that the number of FLISPs delivered each year has not changed significantly, an actually decreased by nearly 14 percent in 2018/19. Over the same period, the number of resale transactions of houses valued R300 000 or less is declining: from 12 574 in 2015, to 11 621 in 2017. The number of resale transactions of houses valued under R300 000 dropped by almost 4 percent in 2017/18. It is hoped that the changes to the FLISP policy will enable an expansion of the programme boosts activity in the resale market at the lower end of the property ladder. According to the 2017/2018 Annual Report of the National Department of Human Settlements, more than 260 000 government employees have gained access to bonds, refinancing, switching, non-mortgage loans and, in some instances, FLISP, through the Government Employee Housing Scheme (GEHS). 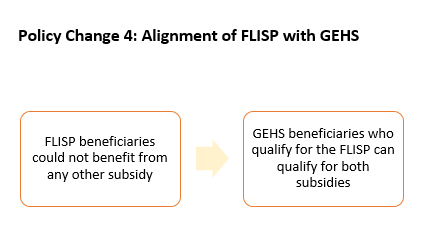 Building on this approach, the recent changes to the FLISP programme allow public servants who receive housing assistance through the GEHS programme to also qualify for the FLISP programme. This means that public servants could receive both GEHS and the FLISP subsidies, thus substantially improving their access to housing finance and thus affordable housing. Previously, only those who accessed a bond from a bank were eligible for FLISP. However the recent changes extend the scope of the FLISP programme to include non-mortgage options such as a housing loan facility, short-term loans, and savings-linked schemes. For example, persons who access personal loans backed by their pension or provident fund will now be eligible for a FLISP. The loans must still be linked to the purchase of a residential property and would need to be issued by registered lenders. The National Department is currently finalising the financial modelling for non-mortgage options and developing the administrative arrangements for these options, so its not yet clear how this would work in practice. Furthermore, persons who bought a property through a Deed of Sale arrangement are now able to apply for a FLISP when they take transfer of the property. Under a Deed of Sale arrangement, a buyer enters into a written agreement whereby they pay monthly instalments on a house. The seller remains the legal owner of the property until a the buyer has made an agreed number of payments covering a prescribed percentage of the purchase price. When this point is reached, the ownership of the house is shifted to the buyer, and the buyer is also able to apply for a FLISP to cover the balance of the purchase price or to access a mortgage to cover the remaining amount. The appointment of the National Implementing Agent (NIA) whose role is to serve the private and public sector markets. The National Housing Finance Corporation (NHFC) serves as the IA. The Human Settlements Development Grant (HSDG), the main conditional grant which flows from the National Department to the provincial department to fund housing delivery, will be top-sliced, so that a portion of the grant is retained at national level and transferred to the NHFC as the Implementing Agent. The top-slice will include operational funding for the NHFC as well as funds for FLISP subsidies. The provincial department will also set aside some of their HSDG for FLISP subsidies, to be provided to beneficiaries as part of new-build IRDP projects. Therefore beneficiaries can access FLISP in two ways: directly from the NHFC (primarily for houses purchased on the resale market) and from the provincial departments as part of new IRDP housing projects. All of these changes have arisen from the need to improve the poor performance of the FLISP which was noted in the National Department of Human Settlement’s 2017/2018 Annual Report. The Annual Report states that the Department under-achieved on its planned target of delivering 5 000 FLISP subsidies to approved beneficiaries in 2017/18, and only managed to deliver a total of 2 295 subsidies for that year. Although reasons for this vary per province, the reasons cited by the Department include: the unavailability of affordable stock, the unaffordability of people earning less than R15 000 per month and the under-spending of the NHFC due to applicants not qualifying for FLISP subsidies. In addition to the key changes introduced in July 2018, other measures may be implemented to ensure that the FLISP programme reaches its target. Some examples of this suggested way forward as outlined in the 2017/2018 Annual Report include: reinforce the potential of existing outreach campaigns for FLISP and consumer education toward homeowners, and encouraging provinces to prioritise FLISP to enhance the performance of the subsidy. The inefficient turnaround time of Provinces (who operated at a much slower pace when compared with financial institutions) was another contributing factor to FLISP’s underperformance. These amendments to the FLISP policy are an important step in the right direction, addressing some of the key weaknesses in the programme, including the subsidy quantum and the programme scope. Increasing the subsidy quantum and the upper income threshold will expand the reach of the programme and make housing finance more affordable for lower income households. Centralising disbursement with the NHFC will hopefully improve efficiency, as the banks will not need to engage with each provincial department separately. And the exemption of FLISP from the 8-year sales restriction has the potential to release low-end properties onto the resale market, thus improving housing supply at the bottom end. However the devil is in the detail, and it will be extremely important for clear and well-thought-out guidelines to be produced which address the complexities of applying the FLISP to non-mortgage loans, and adequately tackle the major challenges in FLISP which are the slow, bureaucratic approval and disbursement processes as well as the lack of public awareness and take-up of the programme. If these challenges can also be addressed, these policy changes have the potential to significantly increase the impact of the programme in enabling access to affordable housing for low income households.